automotive industry automation Delikon EMI Shielding Heavy Series Over Braided Flexible Conduit and over braided conduit fittings System protects metal industry automation drive and control data and signal cables for high noise level locations of heavy processing plants such as steel mills and foundries. 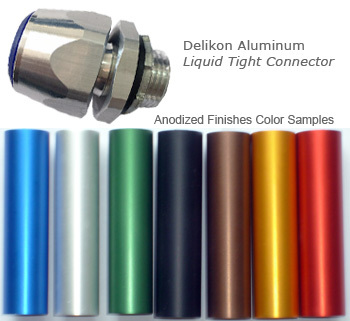 Delikon heavy series connector with metal clamping ring design provides positive shielding termination. Industrial applications such as the factory floor are typically electrically noisy environments. Electrical noise, either radiated or conducted as electromagnetic interference (EMI), can seriously disrupt the proper operation of equipments. The primary way to combat EMI in cables is through the use of shielding. Delikon heavy series over braided conduit system is providing additonal mechanical protection as well as EMI shielding to drive and control cables of intelligent industry automation to ensure a frictionless flow of data and material.